SAN DIEGO /California Newswire/ — At 8:30 a.m. today, two Pilatus PC-12s will depart Lindbergh Field on a goodwill mission to Quito, Ecuador. The flight is scheduled to touch down in Quito on March 31, exactly 75 years later to the day that the first such flight was made in a 1931 Ryan Brougham piloted by Theodore Gildred, Sr. – who stayed in Ecuador following his epic journey to establish that country’s first air mail service. Today his son, Ambassador Theodore Gildred and his grandsons Ted III and Stephen, will honor the memory of that achievement with a similar flight, dubbed “Ecuador III – The Spirit of Goodwill.” Their mission will cover some 4,200 miles and will include stops in Mexico City; Guatemala City, Managua, Nicaragua; San Jose, Costa Rica; Panama City and Quito. At each stop, the aviators will meet with local officials, civic leaders and the media to promote goodwill and better relations between the United States and Latin America. In addition to Pilatus and their distributor Aviation Sales, Inc., the flight is sponsored by The San Diego Aerospace Museum and the Institute of the Americas. 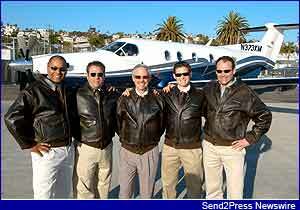 Photo Caption: HEADED FOR HISTORY: [L to R] Pilots Brian Shaul, Ted Gildred III, Ambassador Theodore Gildred, Stephen Gildred, and Eric Corpataux stand before one of the team’s two Pilatus PC-12s on the eve of departure for their 75th anniversary flight to Quito, Ecuador. “We’ve certainly come a long way since my father’s flight” said Ambassador Gildred. “But while aviation has advanced considerably, there is still a tremendous need to do all we can to maintain and improve relations between the United States and Latin America. Building upon the legacy of the first Ecuador mission, and the spirit of goodwill it carried is the purpose our flight today and will continue to be a guiding principal for our family.” Theodore Gildred is the former United States Ambassador to Argentina and today serves as Chairman of San Diego-based Lomas Santa Fe Corporation. He also leads the Gildred Foundation, a grant from which helped establish the Institute of the Americas. The 1931 flight to South America took 18 days and was greeted by some 15,000 Quito residents, who anxiously awaited Gildred Sr.’s arrival at the city’s new airport. His Ryan Brougham was later acquired by the Ecuadorian government, and put to use as that country’s first mail plane. An exact replica of the original Ryan Brougham is housed, along with flight memorabilia, in the San Diego Aerospace Museum. Today’s flight will take just seven days, thanks in large measure to the Pilatus PC-12 business aircraft being used for the mission. The Swiss built PC-12 is a fully pressurized nine passenger aircraft that cruises at 30,000 feet and 310 mph. Ambassador Gildred will be flying his own PC-12, aptly named the Ecuador III, on this mission with an identical chase aircraft being provided by Pilatus Business Aircraft, headquartered in Broomfield, Colorado. Following completion of the mission, Ambassador Gildred will continue to Argentina with his aircraft to visit old friends and to be hosted at a special event at the U.S. Embassy there. A unique aspect of the Ecuador III flight will be the ability of interested observers to follow and even contact the flight, using the Internet. In addition to the mission’s own website (www.ecuadorgoodwillflight.com), NBC Channel 39 in San Diego will carry the mission on their site (nbcsandiego.com/flightofecuador/) that will also allow visitors to send emails to the crew, which will be answered daily. Children from the San Diego school district will also be given special access to in-flight information and the mission’s progress. Ecuador III will actually be Ambassador Gildred’s second such trip. In 1981, to commemorate the 50th Anniversary of his father’s historic flight, he replicated the goodwill journey in a Stinson Reliant loaned by the San Diego Aerospace Museum, landing in Quito at the same time and day as his father’s original flight fifty year earlier. Gildred’s 1981 itinerary included stops in Mexico, Guatemala, Nicaragua, Costa Rica, Panama, and Ecuador. Following the successful completion of the 1981 commemorative flight, the San Diego Aerospace Museum donated the aircraft to the people of Ecuador to help them establish their own aviation museum. On behalf of the Gildred Foundation, which was created by his father, Gildred also presented a gift of $30,000 as seed money for the museum, in which the Stinson Reliant would become one of the major exhibits. Prior to today’s departure, Ted III and Stephen have made their father a promise: Twenty-five years from now — in March 2031 – on the 100th anniversary of the original flight, they will make the flight again to honor their grandfather and father and continue the spirit of goodwill that has become a cornerstone of their family tradition. The Pilatus PC-12 is the best selling turbine-powered business aircraft in the world. The PC-12 fleet now exceeds 600 aircraft and has logged over 1.2 million flight hours with operators worldwide. Pilatus Aircraft Ltd was founded in 1939 and is currently world market leader in the manufacture and sale of single-engine turboprop aircraft. It is the only Swiss company that develops and produces private and training aircraft. At the headquarters in Stans, Switzerland, Pilatus is licensed to maintain and perform upgrades on a variety of aircraft. This service is complemented by four independent subsidiaries in Altenrhein and Geneva Switzerland, in Broomfield, Colorado (USA) and Adelaide, Australia. With over 1,000 employees at its headquarters, Pilatus is one of the largest employers in Central Switzerland.